In order to keep its billions of users safe, Google has introduced another security defense for its Android devices, called Google Play Protect. Google Play Protect, which is part of the Google Play Store app, uses machine learning and app usage analysis to weed out the dangerous and malicious apps, which have always been albatross around the tech giant's neck. Since Google Play Protect actually comes with the Google Play Store, users do not need to install or activate this security feature separately. 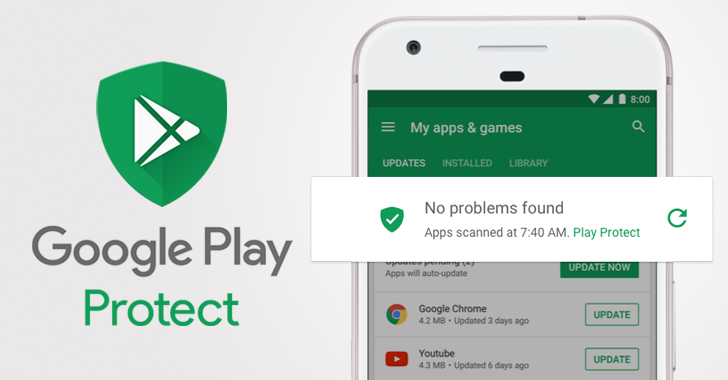 Google Play Protect is an always-on service on devices which said to scan 50 billion apps each day across a billion Android devices to ensure they are safe. Google already has a number of security measures in place to help keep your smartphones safe, including Verify Apps and its Bouncer service, but once apps are uploaded to the Play Store and installed on your device, Google does not have anything in place to monitor the behavior of those apps – something that most malware apps were abusing. Running automatically in the background, Google Play Protect is actually built into devices, which will not only analyse apps before appearing on the Play Store, but also monitor them once installed on the device, including apps that have been installed from third-party stores as well. For this, Google makes use of machine learning algorithms that automatically compares app behavior and distinguishes those acting abnormally, and if encounters any malicious app, it warns you or even disables the app to prevent further harm. Google says the new machine learning system regularly updates to help Android ecosystem stay one step ahead of any potential threats by always looking out for "new risks, identifying potentially harmful apps and keeping them off your device or removing them." With the introduction of Google Play Protect, Android Device Manager has been replaced with Find My Device, use to locate lost and misplaced devices. You can use the browser or any other device to remotely call, locate, and lock, your Android device or even erase the data to protect sensitive information remotely. Find My Device is the same old solution, but Google included it into the Google Play Protect program. With Safe Browsing feature in Chrome, Play Protect lets users stay safe while browsing the Internet. Usually, virus, malware and worm land on to your smartphones and computers via malicious web browsers. So, if you visit any website that is acting suspicious, Safe Browsing feature will warn you and block websites that feel sketchy or seems to be unsafe for you. Google Play Protect service will be rolling out to Android devices over the coming weeks.